"Inglaterra e Estados Unidos são dois países separados por uma língua em comum." O inglês é falado de maneiras diferentes nos dois lados do Atlântico. Com o passar dos anos, as diferenças entre o inglês britânico e o americano levantaram debates e discussões fervorosos. O inglês britânico moderno é altamente influenciado pelo inglês americano, fazendo com que muitos contrastes desapareçam. A pronúncia é, em alguns casos, bem diferente, mas a grande maioria dos cidadãos americanos e britânicos entendem facilmente uns aos outros. Antes de focarmos as diferenças mais importantes entre os dois principais tipos de inglês, ressaltamos que estas diferenças são de importância mínima, e, com a internacionalização em andamento do nosso mundo moderno, pode-se afirmar que elas estão diminuindo. Durante a maior parte do século XIX, alguns cidadãos ingleses defendiam a opinião de que os americanos estavam "maculando" ou "corrompendo" sua língua-mãe. Se interpretarmos "maculando" e "corrompendo" por "mudando", então estes puristas ingleses estavam mesmo corretos. No entanto, eles não entendiam que a mudança é o destino inevitável de todas as línguas vivas. Ainda assim, as suas reações parecem compreensíveis. Talvez os orgulhosos cidadãos do país colonizador se consideravam os "guardiões" da língua inglesa. Porém, mesmo os próprios "guardiões" não estavam imunes a ataques dos seus irmãos "Ianques"*. O político americano John Hays, por exemplo, criticou abertamente o inglês britânico como sendo afetado e pomposo, ao mesmo tempo que elogiou a variante americana como sendo incisiva e direta. Até mesmo nos dias atuais você ainda irá ouvir pessoas comparando o inglês britânico e o americano e discutindo qual é o "melhor tipo de inglês". Tais discussões, todavia, revelam no final das contas nada mais que uma preferência pessoal de alguém. Defender que uma variedade qualquer de inglês é superior a outra é o mesmo que dizer que carne assada é melhor que frango à milanesa. Há alguns autores, por exemplo, que sustentam que a versão falada do inglês americano está se tornando cada vez mais dominante por diversas razões. Um exemplo que ilustra por que o inglês americano tem um maior impacto sobre o inglês britânico que vice-versa: quando você vai para o Reino Unido e liga a TV, você vê muitos programas e filmes americanos os quais, obviamente, são transmitidos em sua versão original, ou seja, americana. Consequentemente, em especial os jovens que assistem TV irão aprender muito do vocabulário e expressões idiomáticas norte-americanos, que são facilmente internalizados e utilizados como se fossem de sua própria língua. Além do mais, o inglês britânico moderno é muito mais passível de ser influenciado pelo inglês americano do que o contrário, pois, se você mora nos E.U.A. e assiste TV, raramente verá um programa ou filme britânico. Hoje em dia, o inglês se tornou uma Língua Franca**, falado com muitos sotaques por muitas pessoas no mundo. Em vista dessa diversidade cultural anglo-falante, a noção de que o inglês britânico é o "melhor tipo de inglês" é claramente ultrapassada. O inglês britânico é simplesmente uma dentre as muitas variedades singulares de inglês que existem hoje. Para completar, as poucas diferenças que existem entre o inglês britânico e o americano tendem muito mais a enriquecer a comunicação do que a torná-la mais lenta. Antes de entrarmos em detalhes sobre o tema inglês britânico, vamos primeiramente clarificar o termo inglês britânico. Para atendermos às nossas propostas, iremos utilizar o termo inglês britânico para nos referirmos somente ao inglês falado na Inglaterra. Tal distinção é necessária pela simples razão de que o termo inglês britânico pode ser mal interpretado. Talvez ele possa ser entendido como um termo genérico para todas ou qualquer variedade de inglês falado nas Ilhas Britânicas (veja mapa abaixo), que são formadas por Inglaterra, Escócia, País de Gales e Irlanda. A ideia de que estes países formam uma cultura ou grupo linguístico homogêneno é errônea. Os irlandeses, escoceses e galeses provavelmente ficariam ofendidos caso fossem chamados de ingleses. Diferentemente da Inglaterra, cuja maioria dos habitantes são de origem anglo-saxônica, as populações da Irlanda, Escócia e País de Gales são predominantemente de origem celta***. A única maneira de sermos justos ao Inglês Irlandês, Escocês ou Galês seria discutirmos separadamente cada um deles. *Ianque - Originalmente significava uma pessoa que vem ou vive em qualquer um dos estados do norte dos E.U.A., especialmente Nova Inglaterra. Atualmente também significa qualquer pessoa de origem norte-americana. ***Celtas - Um dos antigos povos Indo-Europeus da Europa Ocidental e Central que mais tarde migrou para os países conhecidos hoje como Irlanda, Escócia e País de Gales, bem como para partes da França, Espanha e Portugal. English is spoken differently on both sides of the Atlantic. Over the years, the differences between British and American English have given rise to much heated debate and discussion. 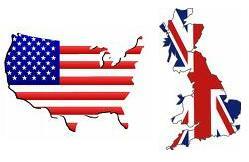 Modern British English is heavily influenced by American English, so some contrasts are disappearing. Pronunciation is sometimes very different, but most American and British speakers can understand each other easily. Before we take a look at some of the differences between the two main types of English, we stress that these differences are somewhat minor and with the ongoing internationalization of our modern world they could even said to be diminishing. During much of the nineteenth century, some English people held the view that the Americans were "defiling" or "corrupting" the mother tongue. If we understand "defiling" and "corrupting" to mean "changing", then those English purists were indeed right. However, they failed to understand that change is the inevitable destination of all living languages. Still, their reaction seems understandable. Perhaps the proud citizens of the mother country thought of themselves as the "guardians" of the English Language. But even the "guardians" themselves weren't immune to attacks from their "Yankee"* brothers. The American statesman John Hays, for example, openly criticized British English as affected and pompous, while he praised American speech as incisive and straightfoward. Even nowadays you'll still hear people comparing British and American English and discussing which is "the best kind of English". Such discussions, however ultimately reveal nothing more than one's personal preferences. To argue that any variety of English is superior to another is like saying that roast beef is tastier than fried chicken. There are some authors, for example, who supports that the American Version of spoken English is becoming more and more dominant for several reasons. An example to show why American English has a stronger impact on British English than vice versa: when you go to UK and switch on the TV you will see a lot of American shows and movies which, of course, are shown in the original, American version. Thus, especially young people watching TV will learn a lot of american vocabulary and phrases which they easily internalize and use as their own. It follows, modern British English is much more likely to be influenced by American English than the other way round because when you live in the US and watch TV you rarely will see a British show or film. Today, English has become a lingua franca** spoken with many accents by many people througout the world. In view of this English-speaking cultural diversity, the idea that British English is the "best kind of English" is clearly an outdated notion. British English is simply one of the many unique varieties of English that now exist. Besides, the few differences that exists between British and American English tend rather to enrich communication than slow it down. Before we deal with the subject of British English in detail, let's first clarify the term British English. For our purposes, we're going to use the term British English to refer only to the English spoken in England. Such a distinction is necessary for the simple reason that the term British English can be misleading. It could be understood as a generic term for all or any of the varieties of English spoken in the British Isles (see the map below) wich consist of England, Scotland, Wales and Ireland. The idea that these countries form a homogeneous culture or linguistic group is erroneous. The Irish, Scots or Welsh would probably take offense at being called English. Unlike England, most of whose inahbitants are of Anglo-Saxon origin, the populations of Ireland, Scotland and Wales are of predominantly Celtic origin***. The only way we could do justice to Irish, Scotish or Welsh English would be to grant each separate discussion. *Yankee - It orginally meant a person who comes from or lives in any of the northern states of the US, especially New England. Nowadays it is a term referring to someone of the US origin and heritage. **Língua Franca - A universal language. The term lingua franca comes from the Latin and it originally refers to a language used as a medium of communication (the way Latin was at one time) between peoples of different languages. ***Celts - One of the ancient Indo-European peoples of Western and Central Europe that later migrated to the countries known today as Ireland, Scotland and Wales as well as to parts of France, Spain and Portugal.